It may have been almost three months, but we still can’t believe Toronto’s notorious Power Ball is already over. 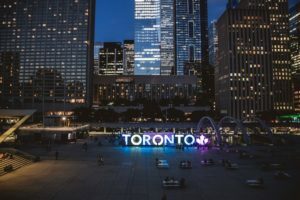 The event may have first started up almost twenty years ago, but it seems only to have fought its way to the coveted spot at the top of fashionable Toronto’s social calendar in the past few years. For those not in the know, the Power Ball is a public arts fundraising event, with all money going towards supporting artists and funding exhibitions at the Power Plant Contemporary Art Gallery in Toronto. The party itself is always a riotous affair, consisting of a seven-hour bacchanalia involving risque performers, stunning rooftop views, cuisine from the most lauded restaurants and chefs in the city, and of course gallons upon gallons of the finest champagne. We all love a good party, and this one has undoubtedly raised the bar for trendsetting nightlife in the six. Let’s take a look back at the Power Ball, and see what we can expect in the future. Toronto has always led the way for Canada in terms of nightlife, long being the only place in the country willing to stay open late enough for the party to really get going. The city has always taken a kind of fanatic approach to nightlife, always going to extra mile to show that Torontonians can drink the most champagne, dance the longest, and dress the most outrageously in a bid to one-up every other Canadian city. The party scene of Toronto was once known for being a sleazy, grimy affair, but that’s all changed in recent years along with the runaway gentrification of much of the inner city. The Power Ball is, of course, a rather ritzy affair, and is in keeping with the new Toronto nightlife in which the aim is to look fabulous, eat good food and feel like a queen for the night. The name of the event itself comes from the hugely popular lottery game, which in recent years has been played regularly by millions of Canadians, who can now play Powerball at Lottoland from the comfort of their home by betting on the draw, rather than driving to the US as they used to have to do. The money-fication of the city, the popularity of the lottery, and the new nightlife trends driven by Power Ball are all connected, and highlight the new prominence of luxury in the lives of locals.